Dress Barn in Newton loaned Michelle some clothing for the event and she used jewelry from her home business venture, Premier Jewelry. 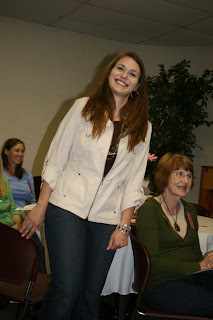 Volunteers modeled several jackets & jewelry. You can see Misty in the cream jacket, Tara in the leather jacket with the yellow printed tee and Vonda in an appliqued jean jacket. All complete with jewelry and handbags! 1-Jeans - dark wash and straight-cut legs flatter most figures. 2-Shoes - use them to dress down or dress up an outfit. 3-Diaper bags - trade out the diaper bag for a large, stylish handbag. 4-Handbags - choose a neutral, solid colored bag (black, brown, silver, cream, tan) if you want one bag to go with everything. 5-Closet - Clean out your closet. Have a clothing swap with friends. 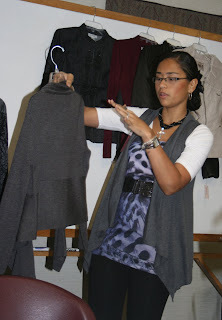 Take clothes you don't wear to a consignment shop, get store credit and buy something you will wear! 6-Jewelry - earrings are the #1 thing that can pull a look together quickly. Larger hoops are great! 7-Focus - draw attention to your neck & wrists (tiniest parts of your body) with short chunky necklaces and bracelets. 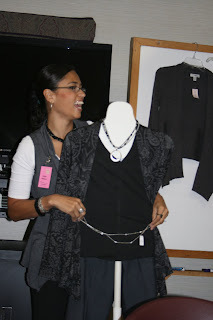 8-Framing - wear a pendant on a short necklace and frame that with a longer necklace. 9-Belts - turn long necklaces into fashion belts by pinning them to your shirt that's worn under a cardigan or to the top of a skirt.